The perfect solution for setting your makeup. 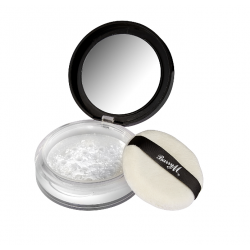 With anti-shine, oil absorbing ingredients, the translucent powder works to mattify the skin and create a flawless, light-weight finish that’s suitable for all skin tones. Apply over foundation for a smooth, brightened complexion with a soft-focus effect. The compact includes a mirror and sponge for on-the-go application. Talc, Zinc Stearate, Phenoxyethanol, Ethylhexylglycerin, Caprylyl Glycol.